New work from the VANBINSBERGEN PLAY STATION: Fifteen, the 15 part music suite commissioned by the Amsterdam City Council in honor of the 15th anniversary of the Westergasfabriek site (Western Gas Works), recorded on March 18th in the Wisseloord Studios. This special celebratory edition also includes tracks from all previous Brokken Records releases. 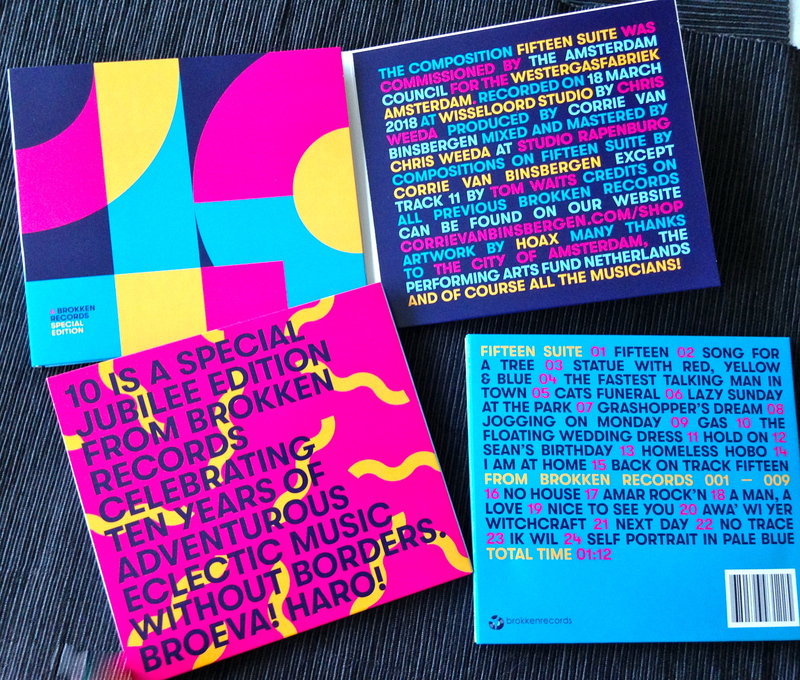 „10” is a special jubilee edition from Brokken Records, celebrating ten years adventurous eclectic music without borders. There is a story behind each part of FIFTEEN SUITE. In the words of Corrie van Binsbergen: All the parts have to do with the site itself or the park, either as images, or as personal associations or memories. I lived in the neighborhood for 20 years, and since 2005 the Stichting Brokken office has been located in Zaal 100 in the De Wittenstraat. Driving bass line with 15 quarter notes. Represents the energy of the Westergasfabriek (Western Gas Factory) site. A second life for Amsterdam trees. Stadshout Foundation (City Wood Foundation) processes trees into beautiful and new objects that are either suffered from blight or have become hindrances. In this way the wood takes on a new function for the city. There is a statue without a title at the entrance to the Westerpark. The piece’s composition is based on the statue’s form. It’s anyone’s guess who I am referring to here: the presenter of the talk show that has been broadcast from Westerpark for quite a few years now. We buried our sweet cat in the park years ago. A little ode to Joop. Cinematic music; I can see an animated cartoon before me for cats, with top hats, solemnly walking along with the coffin. Lying in the grass, chewing on a blade of grass, glass of white wine within reach, in short, chilling on a lazy Sunday afternoon. Short piece of abstract music, a tad alienating. Dozing off in that ‘grass’ maybe? Enough of that lazing around, so put on those running shoes and get going! A big step back in history: when the Westergasfabriek was still in operation. In memory of the great saxophonist Sean Bergin, who always celebrated his birthday in the Westerpark. Joost and I regularly attended the festivities. Plenty of booze, tons of friendly fun. Sean, who was born in South Africa, loved kwela tunes and played them a lot. This is for him. I know a few. The skinny man with the black coat, long beard, long hair, who I still see bicycling past, or the man with the trumpet, who we often heard years ago playing in the park at night or in the morning. ‘I am at home’ is a piece of sculpture made out of polyester. The artist has this to say about it: “Life in the big city can frustrate, tire out or even make a person unhappy. At moments like these all you want to do is disappear and seek out the safest place on earth, like under a blanket.” My inspiration for this part, in which I try to unite the relaxed mood of reggae with the restless, somewhat melancholic melody. Fifteen Suite (tracks 1 – 15) by VANBINSBERGEN PLAYSTATION. All compositions Fifteen Suite by Corrie van Binsbergen, except track 11 by Tom Waits. Recorded on March 18, 2018 at Wisseloord Studio by Chris Weeda. Produced by Corrie van Binsbergen. Mixed and mastered by Chris Weeda at Studio Rapenburg. BR 010 mastered by Chris Weeda at Studio Rapenburg. Credits on all previous Brokken Records see the information in our shop.